The inspiration for this piece came from canapés and hors d'oevres. I love the way that they are attended to individually and each morsel is meant to be presented beautifully to the viewer. The enameled pieces are a copper base with vitreous enamel. The cup bezel is brass and the double pin catch is steel wire. The orange enamled centerpiece uses an over fired technique to give it the "burned" look. Glass seed beads are fused in the orange enamel. The upper pierced enameled piece is utilizing the "sugar coat" technique to give it its permanent sugary texture. 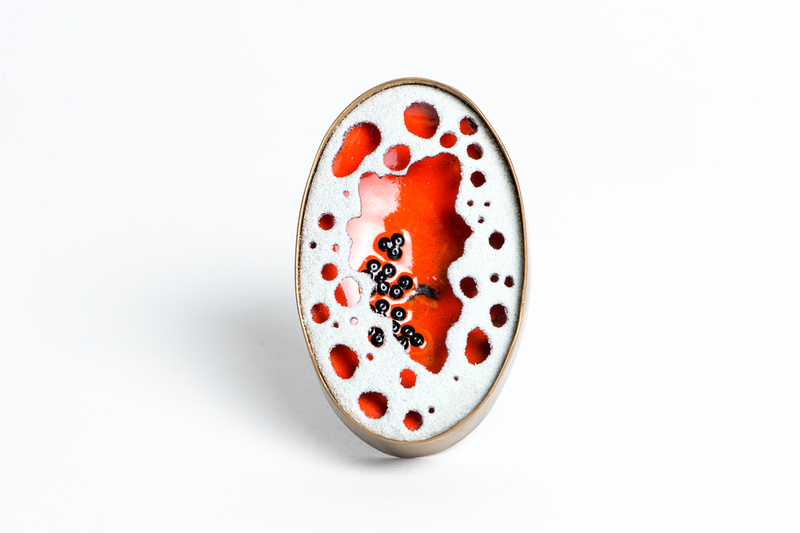 All enameled pieces are kiln fired.